Art students at the Parthum Middle School created this mural to celebrate Thanksgiving. Students in Ms. Giles LifeSkills class at the Parthum Elementary are enjoying their new learning centers thanks to a generous donation from Commonwealth Motors and other community support for the project. Their room was repainted and amazing new equipment delivered that has allowed them to explore and learn with new vocabulary and hands on activities. They were excited to share with Mrs. Elizabeth Daher and her daughter Melissa when they came over from Commonwealth Motors to see the classroom transformation they supported. Thank you so much for this amazing donation! Boston Cares and their volunteers have been doing a great job repainting the Parthums walls beautiful colors. Parthum students will be so excited to be returning to a new year with new colorful classrooms and cafeteria. Parthum Elementary students put on a great performance of Aladdin, Jr.
Genie was there to save the day for Aladdin and Princess Jasmine. Great job to cast & crew! Scooby and Shaggy (Mr. Kane and Ms. Thatcher) were on the case solving mysteries all day here at the Parthum Elementary. They even helped solve the cast of the missing pumpkin! Way to go! 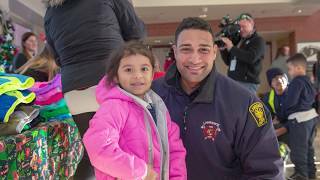 The Boston Bruins and Mass Firefighters delivered winter jackets to students at the Parthum Elementary.